- MindMapper Collaboration Service requires MindMapper 14 Arena. - You can update to the latest MindMapper build by going to the Help menu then choosing Check for Updates. - You can verify if your MindMapper 14 Arena can use the Collaboration Services by looking at your menu. 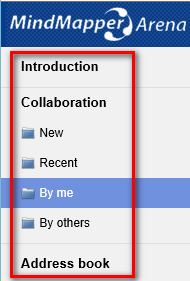 - If your menu contains the Collaboration tab, then your product is ready. 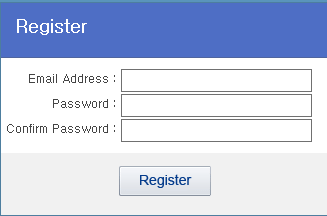 - You must create an account before using the service. - Please click Register on top right of the Arena main page. 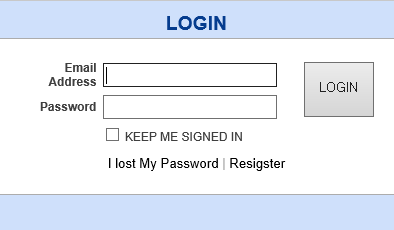 - Or you can go to our website www.mindmapper.com and click Login then click Register to create a new account. then you do not need to create another account. 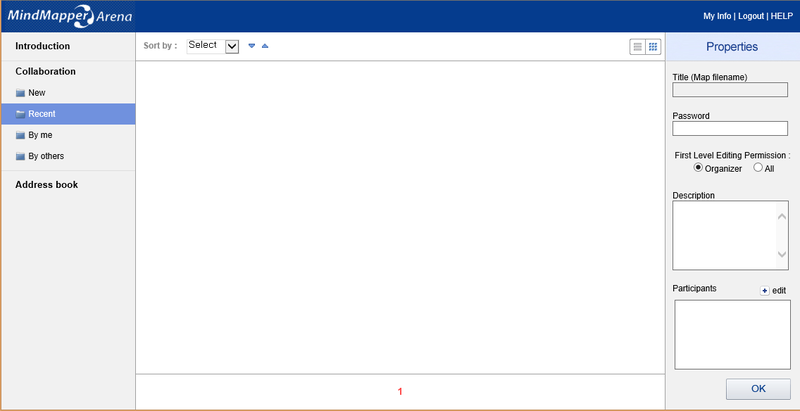 - To create a new meeting, click the New command in the Session group. - You’ll be prompted to login. - After logging in, you will see Arena window appear. In order to start a new collaboration click on New. 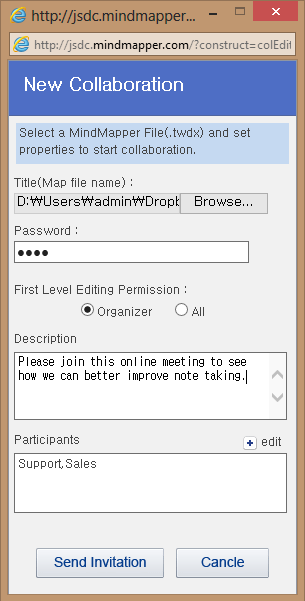 - New Collaboration window will appear with Title, Password (optional), First Level Editing Permission, Description, Participants. - Fill out the information and click Send Invitation. The Meeting email will also contain a link to join the meeting. 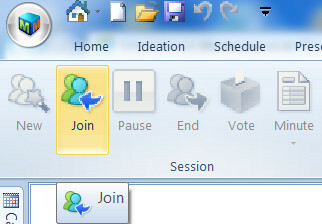 The participants need to simply click this button to join a meeting. Browse your local computer and upload TWDX file you want to share with others. List of most recent files you have worked on. List of files you have shared. You are the organizer of the meeting. List of files others have shared with you. You are the participant of the meeting. List of contacts by individuals or groups. Click this button to see the preview of the file. You can post your map to social media outlets or message boards. Simply past the HTML source code and input it to any outlets that allows direct HTML input. If not, you can still copy the map link and paste it to social media outlets or message boards. Anyone who clicks on the link will be able to see the map in Flash viewer. I. You can view your maps in thumbnail or list. - Select a file from Recent menu, or from files shared by you (By me menu), or from files shared by others (By others menu) and click Join.